Call or email for space availability or to set up a tour. OUR ECLECTIC RETAIL/OFFICE MIX ALLOWS FOR GREATER CUSTOMER VISIBILITY AS WELL AS ONSITE AMENITIES FOR OWNERS AND EMPLOYEES. 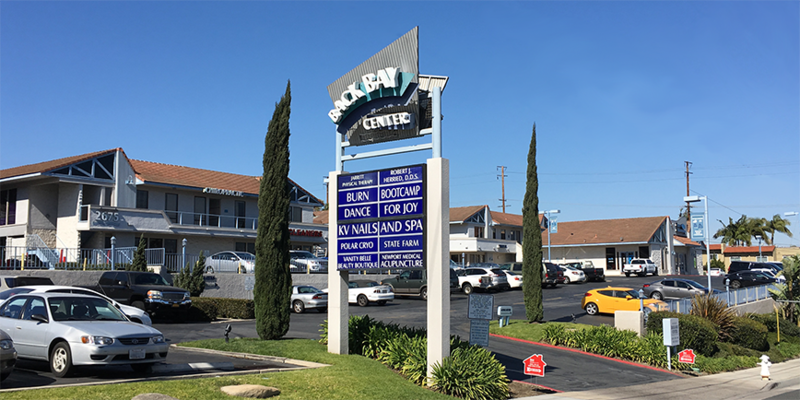 Back Bay Center is conveniently located near the 55, 73, and 405 freeways and Provides a pleasant, upper Newport, Back Bay office environment. Serving Newport Beach and Costa Mesa, CA. Back Bay Center's unique retail and office spaces are available for incubator start-ups to larger company needs. Our eclectic retail/office mix allows for greater customer visibility as well as onsite amenities for owners and employees. Excellent parking just steps away from your office. Walk to lunch and other great amenities!